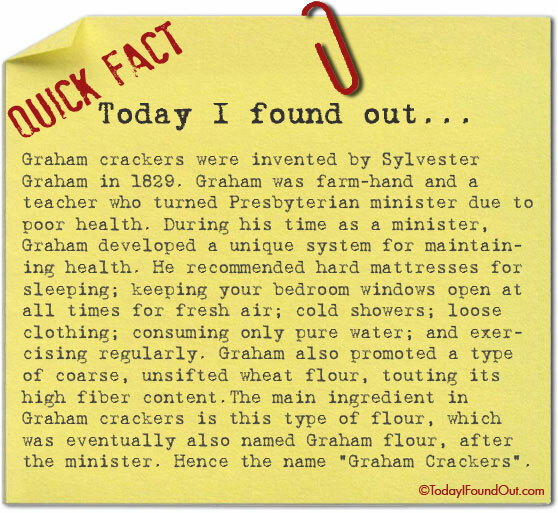 Graham crackers were invented by Sylvester Graham in 1829. Graham was farm-hand and a teacher who turned Presbyterian minister due to poor health. During his time as a minister, Graham developed a unique system for maintaining health. He recommended hard mattresses for sleeping; keeping your bedroom windows open at all times for fresh air; cold showers; loose clothing; consuming only pure water; and exercising regularly. Graham also promoted a type of coarse, unsifted wheat flour, touting its high fiber content. The main ingredient in Graham crackers is this type of flour, which was eventually also named Graham flour, after the minister. Hence the name “Graham Crackers”.